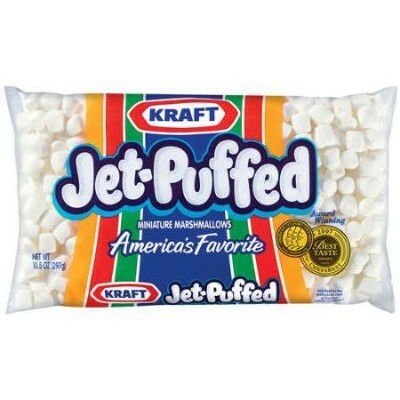 There are marshmallows, and then there are Jet Puffed Marshmallows. Taste one (or ten) and you'll know what we're talking about! 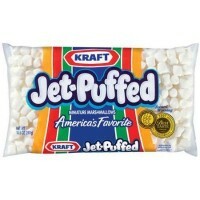 Jet Puffed Mini marshmallows are the ooiest, gooiest, richest and most delicious marshmallows around. Get this fun American treat in a 10.5oz bag and mix them in your hot cocoa, top your favorite dessert, or anything else that needs a little sweet goodness! Corn syrup, sugar, modified corn starch, less than 2% of: gelatin, emulsifier E450iii, natural and artificial flavors, color E133. Contains GMO. Nutrition facts (for 100g): calories 333Kcal, total fat 0g (saturated fat 0g), total carbohydrate 83.3g (sugar 53.3g), protein 0g, salt 0.3g. Sympa, j'aime bien la texture qui est plus légère et moins gélatineuse que les chamallow qu'on trouve ici. Par contre, ils ont moins de gout donc ça n'apporte pas grand chose.